Hey guys so I've been having some issues with my 02 saleen and finally took it to a shop and they said its a vacuum leak. They told me that the intake plenum(connects from the TB to the back of the supercharger) is cracked and contacted saleen who told them basically that they didn't supply them anymore. I was just wondering if anyone knows where I could either purchase a used one or an aftermarket version that would work? Can we weld the inlet and crack? Is this an option? That is an option if that would fix the issue haha. Would it matter where it is cracked? I'm not sure at the moment where exactly it is cracked, I'll be able to find out tomorrow. If that is possible, is it a do at home job? Do you typically weld aluminum at home? The piece is actually plastic, not aluminum. I wouldn't even consider it if it was aluminum. Yeah unfortunately the majority of them are plastic. I thought I've seen a couple of them that were metal (maybe the early ones were for the series 1). Best of luck finding one but it's going to be really difficult. If you have a series II supercharger you need that piece to make it work so it will be in short supply. Even people that upgrade to a KB would sell those as part of the kit when they get rid of the series II. Look for someone that has changed out the entire intake that would be willing to part with it. Last edited by eviligloo; 02-04-2014 at 08:26 AM. I actually did find one that someone on another forum had replaced so I think I'm just going to get that one from him, its plastic as well. I think the one I have is the same as the one on the right in the 2nd picture which I believe is plastic, not 100% sure though. In any case I'm gonna snag this one since they're not easy to come by. I think it is interesting how some elbows appear to have a raised SALEEN marking while others do not. Yes yours looks like the one on the right. The one on the left is the tork tech intake which is metal. My old one is plastic and is sitting in the garage. It has the raised saleen lettering. Yeah all of the plastic ones I've seen have had the "Saleen" raised on it. You wouldn't be looking to get rid of that piece would you? The other one I was going to get has the TB cable mount hole stripped out just like my current one. I'd recommend upgrading to the Tork Tech. I have one on my Series II with one of their oval single blade throttle bodies. Lots more air available = alot more power too! How much was it and what did you have to do to get it to fit? YellowPony: You have the whole Tork Tech System right? Just using their inlet requires a bit of fire wall massaging. I bought it as part of a retrofit kit from someone else here on the boards. you can get parts and prices from Tork Tech. Pricing was about 4 years ago so I'm sure they have changed since then. http://www.torktech.com/mp112-interc...tuner-kit.html The plenum bolted right to the back of the Saleen series II blower. Did an EGR delete because I didn't want to deal with refabbing the stock EGR tube. Used a 03/04 Cobra throttle cable to replace the stock throttle cable. Rerouted some of the vacuum lines by pulling vacuum source through EGR delete plate, but beyond that not much more refabbing. Last edited by yellowpony281; 02-07-2014 at 11:34 PM. Not in this case...I do have the Tork Tech plenum and 63mm x 130mm oval throttle body mated to Series II Saleen (Eaton M90). 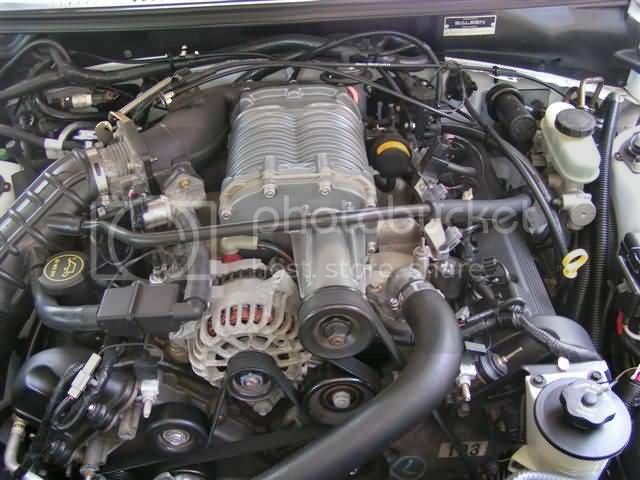 This is the same plenum and TB used in the Eaton M112 4V Cobra blower to 2V swap kit. Because it went on a M90 blower I did not have to do the firewall clearance mods you have to do with M112 mod kit because we moved the vacuum tree to the EGR delete plate as my vacuum source. Last edited by yellowpony281; 02-08-2014 at 12:00 AM. That looks great yellowpony, I've got a similar intake from Tuneable Induction. Did you buy the piece that connects the tb to the maf or have it made? Also I'm not sure if you've seen evil's build or not but he did have to cut into his firewall to get the intake to fit for some reason. Thats pretty much the only reason I haven't bought the tork tech intake yet. Looks like they might have moved the vacuum line connections on your version. They mentione that they were going to do this when I spoke to them. The reason I didn't go this route was the EGR thing... being in CA I couldn't delete it. That is a BBK 03/04 CAI tube. No, this is the version with the ports on the back of the elbow that would have required firewall mods. We just epoxied those ports closed and moved the vac tree off the EGR port. Not really legal in Jersey either, but since this car is registered "collectable" in Jersey I have self inspection. Cool... looks sweet and I know the power is much better as these blowers love air. Evil gave me a ride in his car and I couldn't believe how much that thing pulled... Made my SC feel like it was sucking through a straw. hey yellow pony do or can you post some pictures of the vacuum tree moved to the egr delete port and how you did that i am thinking about going this same route and really do not want to cut into my car. what kind of epoxy did you use did you cut them off flush and then epoxy or just fill the tubes. I have a few spare inlets. I may see about getting them made, in either metal or carbon fiber. Sweet, let me know when one is available, I am ready to purchase and install as of last week, the whistle I am hearing and poor gas mileage is killing me. Thanks again OxfordS281 !